The Jazz gave one of their more impressive road efforts of the 2013-14 season, going toe-to-toe with the 36-18 Trailblazers for 45-minutes before folding late. While Alec Burks provided a scoring spark in the 1st-half and Gordon Hayward turned in a quietly impressive line (17 points, 7 rebounds, 7 assists on 5-11 shooting), the two stars of the game for Utah were clearly Trey Burke and Enes Kanter. Burke scored 21 points on 8-16 shooting from the field and 3-5 from behind the arc, while also dishing 7 assists and grabbing 6 rebounds. Burke completely owned the 3rd-quarter, in which he scored 12 points and handed out 3 assists on a perfect 5-5 shooting, including two threes. In addition, the rookie made an outstanding steal in which he face-guarded Lillard and drifted with him along the three-point line and used his peripheral vision to deflect an incoming kickout pass, that directly led to a throw-ahead assist to Alec Burks for a fastbreak layup. Although Burke shot just 3-8 on the pick&roll, one of his misses (a driving left-hand layup) freed up Kanter for an uncontested tip-in and another attempted floater enabled Burke to rebound his own miss and score so in reality Utah was 5-10 when he shot via screen-roll. Additionally, on mid-range pick&roll jumpshots Burke hit an impressive 3-4 – critical considering it is Portland’s intent to force opponents to take contested midrange shots while trying to minimize scramble rotations that often lead to open threes and paint points. Burke nailed 2 of his 3 catch&shoot three-point attempts and of his 7 assists, 4 came in transition (or early offense before the defense could setup) while two others were setting the table for a Kanter jumper via pick&pop. Burke’s a playmaker with the ability to push the tempo (if the Jazz ever try to do that) and create for his teammates but right now it comes down to making shots. After inexplicably sitting for the first 6 minutes of the 4th-quarter (in which the Jazz shot 1-11 and were outscored 14-2), he came back in the game and confidently drilled a right-wing three to pull Utah back to within 83-80. There’s no question that even as a rookie Trey Burke wants to be the guy to take and make all the big shots, and that’s a quality that will only bode well for the future as the Jazz look to him run the show over the next several seasons. Enes Kanter tied his career-high with 25 points on 12-20 shooting, to go along with 10 rebounds, 4 assists and 3 blocks. Most impressively, Kanter scored his points in a variety of ways. He shot 2-3 and scored 5 points when getting touches on the left-block. He shot 3-4 from direct opportunities via the pick&roll, including 2-3 on pick&pop jumpers. He scored 6 points on 3-6 shooting on offensive rebounds and he was a perfect 4-4 playing off-the-ball as a weakside dive/kickout man (including 2-2 on spotup mid-range jumpers). He’s shown he can be an effective low-post scorer but doesn’t demand the ball to find ways to contribute, with his offensive rebounding and pick&pop ability helping to round out his game. Kanter also started in place of Favors in Utah’s December-9th meeting with Portland and had an impressive game as well, scoring 19 points on 50% shooting as Utah also hung in against the Blazers before another late collapse. From the outset one member of the Utah Jazz broadcast team made it a point to harp on what he considered poor defense by Kanter – namely Kanter’s refusal to show out and contest a lot of shots on the pick&roll. Similar to how teams used to attack Al Jefferson in the previous two seasons, Portland made it a priority to involve Kanter in defending pick&roll as often as possible. Utah’s strategy remained simple – allow Kanter to drop back into the lane and force Portland into taking a lot of mid-range jumpshots. Of the 41 direct pick&rolls that involved Kanter defending the screener, Utah allowed just 31 points on initial defense (not counting second-change opportunities). Of those 41 plays, Portland shot 13-34 (38.2) from the field, drew 3 fouls (resulting in 4-4 from the foul line) and turned the ball over 4 times. Most impressively, out of their 34 shot attempts only two were three-point field goals. Obviously the Blazers missed LaMarcus Aldrige’s mid-range shooting but when Kanter was involved in defending screen-roll, Utah could not have asked for better results against Portland’s high-octane offense. One negative is how susceptible Utah leaves themselves on the offensive glass. With Marvin playing at PF, anytime their center (be it Kanter or Favors) leaves his man to help, Utah is left with a huge disadvantage trying to rebound the basketball (12 offensive rebounds for Portland tonight). Nevertheless, allowing 31 points on 41 possessions speaks for itself. Considering there were also a handful of plays where the initial screen-roll yielded no shot so Portland continued to move the ball, admonishing Kanter’s defensive performance last night is not only unnecessary but ridiculous. Kanter will give up points at the rim but he also did a good job staying vertical in his challenges which resulted in quite a few Portland misses in the paint (many by Lillard who is among the poorer finishers in the basket area). It’s also important to remember Kanter isn’t a shotblocking force. Jerry Sloan didn’t rant and rave on the sideline when Mehmet Okur didn’t block a shot and Kanter deserves a similar approach. What you ask for from Kanter is good positional defense where he can use his 6-11 frame to contest shots to the best of his ability, and if the ball still goes in the hoop you can live with it because he can contribute in a lot of other ways. One really neat thing about the Blazers telecast is Portland’s sideline reporter, Michael Holton, was able to listen in on the Blazers’ huddle during the timeout and then relay that information to the viewers prior to the start of the 4th-quarter. Some of those adjustments were noticeable on a Burks turnover (7:59 4th-Qtr) where they pushed him wide and stole the ball as he tried to come back middle but a lot of it came down to Robin Lopez closing up the middle when there appeared to be gaps in the defense. Regardless, it’s nice to be given access to that type of inside information as the game progresses. It was reminiscent to the days of the NBA on NBC when Jim Gray would camp by Utah’s bench and report Jerry Sloan’s message to his team during timeouts. Overall last night’s is precisely the type of contest you hope the Jazz have more of as the season winds down. Although Portland is in a bit of a funk while playing without LaMarcus Aldrige and an under-the-weather Nicolas Batum, the Jazz’s young core came to play and pushed the Blazers to their limit, forcing Portland to elevate their game to another level. I believe it’s those 10-12 minute stretches when opponents raise their intensity like Portland did to start the 4th-quarter that is ultimately more beneficial to Utah’s growth and development than the other 36 minutes played at the regular speed limit. Burke, Burks, Hayward, and Kanter all had their moments on the road against a good team. At this point when you know what to expect from the coaching and other role players, that sort of thing is really all you can ask for at this point. I don’t believe in moral victories in professional sports, but if there is such a thing as a “good loss,” this was probably it. Lost amid Wednesday night’s homecoming buzz for former Jazzmen Deron Williams and Andrei Kirilenko was the very real possibility that Brooklyn’s 105-99 victory over the Jazz could have been the final game Kevin Garnett ever plays in Utah. The first time Kevin Garnett played a regular season game at the Delta Center, he came off the bench behind Sam Mitchell. His head coach at the time, Flip Saunders, boasted a coaching record that stood at 1-4 and not the 638-526 mark it does today. The leading scorers on his team were Tom Gugliotta, J.R. Rider and Sean Rooks. Sound like nearly two decades ago? It was. Trey Burke was 3 at the time. On that late December evening in 1995, a 19-year old KG scored 6 points and grabbed 6 rebounds in 22 minutes for the Timberwolves. On Wednesday night, a 37-year old KG scored 6 points and grabbed 4 rebounds in 17 minutes. While KG’s play and production has marginally decline for the past several seasons in Boston, this season it has fallen off the proverbial cliff to the point the Big Ticket is now obviously running on fumes. My most fond memories of Kevin Garnett are the fierce battles he had against Karl Malone and the respect he showed for him. On January 19, 2000, KG scored a game-high 31 points in defeating the division-leading Jazz 91-88 at the Delta Center. Following the game, the 23-year old Garnett approached the 36-year old Malone and told the league’s reigning MVP he disagreed with the recently released All-Star voting, feeling that Malone deserved to be a starter and not himself. The respect KG showed for the league’s greatest power forward continued ten days later in Minneapolis. Karl Malone surpassed the 30,000th point plateau, a milestone that was recognized by the Target Center’s public address announcer. As the T-Wolves fans offered their polite applause, Garnett waved his arms to exhort the crowd and Malone ended up receiving a standing ovation from the Minnesota fans. Despite the dissimilarities in their styles and KG spending the first 4 years of his career at small forward, in many ways both players redefined the power forward position. Malone became the best to ever play the position by merging his relentless physicality and power with an elite scoring skillset. Garnett brought finesse and athleticism to go with remarkable dexterity and unbridled passion in showing the position could be played post-1980’s at an elite level despite a lack of broad shoulders and powerful frame. He’s arguably the greatest defensive power forward to ever play the game and represents the prototype for the ideal power forward in the new millennium. The other similarity both Malone and Garnett shared is they played the game the right way – passionately and competitively – giving maximum intensity and effort at both ends of the court all toward one goal that wasn’t self-promotion but rather winning. They were old school with their toughness and their attitude, as KG brought some of the NBA’s 90’s nastiness into the new “hug and kiss” post Artest-melee league. Combined with an ability to score the basketball that few power forwards have ever possessed, when those two faced off they treated fans to battles that only augments the their legendary careers with the passing of time. Their meeting on February 17, 2003 is a perfect example. First, their statlines. Garnett scored a game-high 34 points, to go with 10 rebounds, 6 assists 1 steal and 1 block. Malone scored 28 points with 9 rebounds and 6 assists. Both were incredibly efficient, with KG shooting 13-22 (59%) from the field and 7-9 from the foul line. Malone shot 10-14 (71%) and 8-9 from the stripe. Second, their effort. It was a 12-point game with a minute to play, and both Malone and Garnett show no hesitation in diving to the floor for a loose-ball. Malone was 39 year old. Garnett had dislocated a finger on his right hand earlier but still wedged his hand in while wrestling for the basketball (in the 3rd-quarter KG walked to the bench, sat down, looked away as the trainer popped it back in and then returned to the game). Third, label this exhibit-Z why Karl Malone was a freak of nature. He was 39 years old and still capable of playing at this level. THIRTY-NINE! For as much as KG’s mind wants to play at a certain level, this season he is calcifying right before our eyes at age 37. Considering Garnett’s in his 19th season and has played over 48,000 minutes, that’s certainly expected but it just illustrates the absurd and unmatched degree to which Karl Malone defied Father Time, even in 2003 during his 18th season at over 52,000 career minutes. 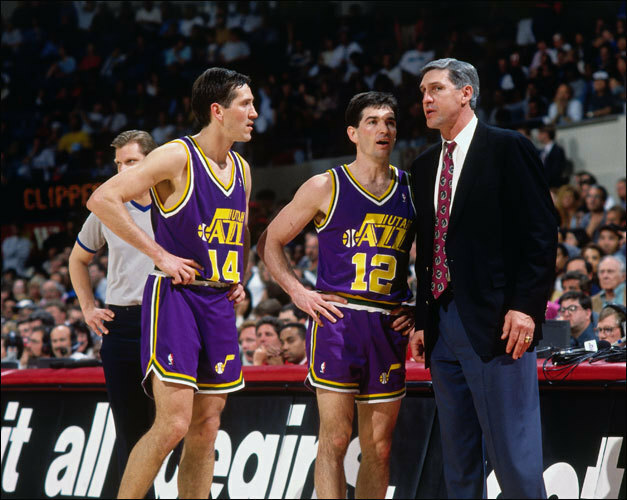 Final Note: On Jerry Sloan’s technical, the urgency at which Jazz trainer Gary Briggs and assistant Gordan Chiesa moved to reel him followed by Jerry’s subtle wink and “I’m all right” assurance has a small backstory. This was only Jerry’s second game back since returning from a 7-game suspension for shoving referee Courtney Kirkland. Given that this was his first technical foul since and that it involved Violet Palmer, it’s apparent everyone on the Jazz was relieved the situation was diffused quickly. While some may prefer Garnett to call it quits as soon as possible, I have no problem with him playing until the well runs completely dry. Great players who have given so much to the game deserve to leave on their terms, not their fans’ terms. Personally, I’ve always felt more closure when a great athlete retires well past his prime rather than during it. This was true as Malone limped to the finish line in the 2004 playoffs with LA and when Michael Jordan finished out his career in DC. They may not have been as good as they once were, but every once in a while they would come close and those games just felt magical – as if you were granted the gift to travel back in time to witness one final great performance as the curtain was lowering for good. The end may be near for KG’s career, but that will in no way tarnish the brilliance of his illustrious career. And when Garnett is rightfully inducted into Springfield, it would be fitting if Karl Malone was the one to present him. Like many sports-loving families, growing up my Dad and I would play pickup basketball in our driveway. By the time I reached junior high, I was tall, quick, and athletic enough to beat him handily, but I didn’t. Every game felt like a battle to the final shots* (*win by two). My Dad was still heavier and stronger, so he would back me down from about 20-feet and shoot an unblockable hook shot off our very forgiving backboard. Defensively, he would stand about 12-feet from the basket and dare me to shoot from 19’9″ (the high school and at the time college three-point line). I would make enough threes and he enough high-percentage twos (we scored by 2’s and 3’s not 1’s and 2’s like is done today which further skews the value of a three-point shot) that it would come down to who could achieve the elusive score-stop-score sequence. At that point Dad would suddenly come out and guard me, not quick enough to stay in front of me but clever enough to reach in and rip the ball away as I made my go-to dribble-drive moves which he knew. The point is my Dad played “old man basketball.” He would conserve energy and turn it into a game of fundamentals and standstill shooting for 80% of the game, then get serious and ball out with the game on the line. That’s what the Nets did to the Jazz last night, they beat them playing “old man ball.” For 29 minutes the Nets allowed the Jazz to shoot open threes, outhustle them for loose balls and beat them up and down the court. Then Brooklyn got serious, outscoring Utah 50-31 in the game’s final 19 minutes. Defensively the Nets suddenly were alive, contesting Utah on the perimeter (Utah shot 7-13 behind the arc in the 1st-half and just 2-11 in the 2nd-half) and ripping the ball away from them inside (5 Utah turnovers in the 4th-quarter versus 13 in the first 3). This pattern can be expected for an aging Nets team boasting the 37-year old Kevin Garnett, a 36-year old Paul Pierce and a $200 million backcourt that oddly exudes a vibe that they’re also in their late 30’s olds rather than the 29 and 32 year-olds Deron Williams and Joe Johnson are, respectively. Regardless, when it came to “winning time,” the Nets turned on a switch that Utah couldn’t match physically or mentally. This was a great learning experience for the likes of Alec Burks, Enes Kanter and Trey Burke – but is also problematic of being a season long cellar-dweller in the dead of winter. Opponents test the waters to see if they can get by with a B-effort before deciding to dip a toe in or wade in up to their chest. Sometimes (see Utah’s home wins over Miami and OKC wins) it bites them in the rear, but other times (GS 3 weeks ago and Brooklyn last night) it works and you can’t help but look back and wonder how much of Utah Jazz 1st and 2nd-quarters actually represent meaningful minutes when competing against teams giving marginal effort to start. Starting from opening night against OKC when he was the only difference between a double-digit home loss and a game that went down to the final shot, Alec Burks has enjoyed a break-through season averaging 13.6 points while shooting a respectable 45% from the field and 36% from behind the arc despite just playing 27.3 minutes per game. On a Per-36 Minute basis, Burks scoring increases to 17.9 points and his free throw attempts to 6.0 per game. (By comparison Hayward, Utah’s leading scorer at 16.2 pts/gm actually sees his Per-36 scoring averages decline slightly to 16.0). In the past three games, Alec Burks has been phenomenal – averaging 24.3 points on 60% shooting with 11.3 free throw attempts per game in just 27.0 minutes. Even more incredible, he’s the first Jazz player to post three consecutive games of 20-points all coming off-the-bench since Jeff Malone in March of 1993. I understand why it may be preferable to utilize a gifted scorer in a 6th-man role to provide scoring punch off-the-bench. However, on a lottery bound team in a season designated by everyone as a “rebuilding year,” none of those exist with Alec. The Jazz have virtually nothing to lose in starting Burks for the remainder of the season (also maximizing the on-court time a slumping Hayward has with another scorer on the wing) and very much to gain – including a potential starting 2-guard of their future. As anyone who watched last night’s maddening ending would know, with 32.6 seconds remaining Alec Burks scored on a backdoor cut (off a fantastic left-hand bullet pass from Trey Burke) to pull the Jazz to within 99-95. Down 4 with an 8.6 second differential between shotclock and gameclock, intentionally fouling appeared to be a no-brainer. Yet the Jazz didn’t foul. On the replay you could even see Trey Burke glancing over his shoulder toward the Jazz sideline as he guarded the ball but Ty Corbin stood there frozen as 16 seconds ticked away before the Jazz finally (mercifully) fouled. (They had a foul to give so they had to foul again to send Brooklyn to the line). The Nets made both free throws to make it a 6-point game with 14.9 seconds left. There’s a huge difference between a two-possession game with 30 seconds left and one with half of that time. To me, a general rule of thumb is in a 1-possession NBA game, an 8-second differential is perfectly acceptable to play it out. In a two-possession game, with anything less than a 10-second differential (or lack timeouts) you foul immediately because of the old adage you can regain possession but you can never put time back on the clock. Heck, 4 years ago Jerry Sloan opted to immediately intentionally foul in what was merely a 3-point game with a 5-second differential. The difference became an extra-possession sequence that trimmed the deficit and was culminated by Sundiata Gaines giving Jazz fans arguably the single most euphoric moment in franchise history since Stockton hit “The Shot.” Whatever your strategy, hesitancy will kill clock and kill your team’s chances and that was the case last night. Corbin’s postgame explanation made even less sense. The bottom line is the Utah Jazz coaching staff screwed up, with their eventual decision to foul after 16 seconds of passive defense being the ultimate admission of guilt. If the Jazz do make a deal, there are two realistic goals I’d like the Jazz to accomplish. 1.) Asset accumulation. If Utah can pawn off a Marvin Williams, Richard Jefferson (unlikely) and even a Jeremy Evans (who I really like but whose bargain basement contract and off-the-bench skillset could make him very attractive to other teams) for a future protected 1st-round pick, I would do it in a heartbeat. In the NBA, you need a star player and if you can’t sign one (thank you SLC) you either need to draft one or trade for one. To draft one you either need a top overall pick (looking unlikely for Utah in 2014) or a slew of potentially high picks in which you hope you strike oil with one. To trade for a superstar, you need to accumulate enough assets to make a godfather-type offer in the way Houston acquired a James Harden and Dwight Howard. Utah already has a slew of young talent combined with all of their own 1st-round picks plus two GS 1st-rounders. Add another one and then trust in Dennis Lindsey’s ability to draft/deal. 2.) Long-term Development. Alec Burks needs to start. Kanter (and to a lesser extent Favors) and Gobert need more minutes. If the Jazz can move one of their pending veteran unrestricted free agents (a Jefferson or Williams) who are causing a log-jam toward extending playing time for younger players who factor more prominently into the team’s future, the Jazz need to do it even if the return is only a corresponding expiring contract of a far lesser talent and/or a 2nd-round pick. The Jazz aren’t making a surprise playoff push this season (unlike Jeff Hornacek’ Phoenix Suns). The Jazz vision has to be a 4-5 year window in which 2013-14 season is used to maximize the team’s future not pander to pending free agents the way they did in 2012-13 that netted them nothing both short-term and long-term. 53 games down, 29 to go. In some ways the season feels like it’s taking forever and in other ways there are still a plethora of unanswered questions relating to the future of the Utah Jazz and dwindling time left to answer them. There has been noticeable growth and there has been substantial development, but hopefully we’ll see a lot more to fill in more of the blanks that the Jazz have not tried hard enough to fill. In today’s B.S. Report, Grantland’s Bill Simmons said that believes the Celtics should and will make a run at Gordon Hayward. The entire podcast can be heard here, with the Hayward conversation beginning around the 34:10-mark. For good measure, Simmons and Lowe also briefly touched on Jeff Hornacek. Not counting Boston’s 2014 Draft Pick cap holds, assuming they renounce their rights on Jordan Crawford, don’t pick up Keith Bogan’s 2014-15 salary, and for now slotting Avery Bradley’s $3.2 million qualifying offer in – the Celtics will be around $48 million with 8 players – certainly possessing the wiggle-room to make one additional dump-deal and present Hayward an attractive 8-figure offer. Although re-signing RFA Eric Bledose will eat up a large chunk of it, the Suns also project to have the cap room (although approximate figures vary due to fluctuating cap holds for 2014 draft picks they may or may not receive, along with a $6.8 million player option Channing Frye possesses). So what do you think is Gordon Hayward’s free agency value is, and should the Jazz (or any team) meet/exceed it with the belief that a new coach and upgraded supporting cast can rebuild Hayward’s shooting efficiency – or should the Jazz preemptively trade him to get value in return if they think he’ll get an offer they won’t be willing to match? The Utah Jazz defeated the Milwaukee Bucks in a battle between the two teams with the worst records in the NBA. Gordon Hayward led the Jazz with 22 points (on 8-16 shooting and 3-5 from behind the arc) while Derrick Favors scored 21 (on 9-16 shooting to go along with 11 rebounds and 4 steals). It marked only the second time in their 4-year Jazz careers that both Hayward and Favors scored 20-points or more in the same game. They were joined in double-figures by Alec Burks (13 pts), Trey Burke (11 pts), Enes Kanter (11 pts) and Diante Garrett (10 points) – signifying only the second game that the “Core-5” (Burke/Burks/Hayward/Favors/Kanter) all scored in double-figures in the same game. Play of the Game: 3:18 4th-Qtr – Milwaukee had cut what was once a 14-point Utah lead to 3 late in the 4th when Alec Burks drove middle from the left-wing and converted a fingeroll over the outstretched arm of Larry Sanders. Utah’s offense was out-of-sorts against the Bucks’ 2-3 zone and Burks’ layup sparked a 10-2 Jazz run to seal the victory. Player of the Game: Derrick Favors displayed his offensive diversity as he scored his 21 points on 9-16 shooting in a variety of ways. He shot 4-8 on post-ups, 3-4 on pick&rolls, 1-2 on offensive rebounds (he grabbed 3) and 1-2 on direct dishes/kickouts. After shooting 41.6% in his first 7 games, Favors has shot 55.1% in his last 26. Best Shot: 0:45 3rd-Qtr – A Hayward/Kanter screen-roll collapsed Milaukee’s defense giving Diante Garrett an open top-of-the-key three off a crisp skip-pass by Gordon – which Garrett knocked down. Garrett played quite well in 5 of his first 7 games since joining the Jazz, then jockeyed with John Lucas for 2nd and 3rd PG in the rotation and has since resumed backup duties in the last two games. With 10 points on 4-5 shooting and 2-2 from behind the arc, it was Garrett’s highest scoring game as a pro (in my opinion his 7-point/8-assist game in Dallas is still his best game as a Jazz player). Next week the Jazz will have to decide whether to waive Garrett or guarantee his contract for the remainder of the season. Garrett won’t blow anyone away with his playmaking or shooting (40%FG/36%3pt) but he’s a better option than John Lucas III (32%FG/32%FG) because he understands his strengths&weaknessess, plays within himself, has size, and defends fairly well. Best Block: 5:14 4th-Qtr – Following a Burke turnover, the Bucks pushed the ball in transition but Gordon Hayward rejected Giannis Anteokounmpo’s layup at the rim – pinning the ball to the backboard. Anteokounmpo is a springy 6-9 athletic freak in the mold of a young Kirilenko or Iguodala – and Hayward got the better of him on this above-the-rim play. Hayward recorded 3 blocks giving him 12 over the past 7 games. Gordon’s shooting percentages have fluctuated all season but his all-around play remains a bright spot. Last night shooting efficiency was back on target last night, as he shot 3-7 on catch&shoot jumpers, 1-1 on off-the-dribble jumpers and 3-5 on halfcourt drives to the basket. Best Jazzbasketball Play: 1:15 1st-Qtr – The Jazz got one of their easiest baskets of the night – a Diante Garrett layup – off a well-executed UCLA rub cut. The Jazz ran a few UCLA sets in the 1st-half, not many in comparison to pre-2011, but more than they’ve run throughout most of the 2013-14 season. As I’ll explain below, with so-so offensive production (still just 26th in the NBA) – running more well-executed UCLA sets could open up a much-needed avenue of high-percentage looks. The UCLA set was once a Jazzbasketball staple under the direction and orchestration of Jerry Sloan and Phil Johnson. Utah starts in a standard 1-4 set with a rub cut down the lane – where the ball-handler (normally the PG) initiates the play by passing to the wing before cutting down the lane. With proper timing and accurate passing, this simple set can garner a layup against an average defense atleast 1-2 times per half – either from the initial cut or via multiple secondary options. Here the Jazz run the same set three times against the Bucks in the 1st-half. 1. The first possession the initial rub cut results in an easy layup for Garrett. 2. The second possession the iniital cut didn’t net an open opportunity so the Jazz run through their entire set with the initiator (Burke) running through to set a backscreen for Hayward. The next read for both Burke and the high-post passer (Marvin) is dependent upon Burke’s man (#13 Ridnour). Here, you’ll see Ridnour momentarily help on the backscreen, keying Burke to fire out weakside behind Favors’ screen. Ridnour shoots the gap, and as Burke learns more of the nuances he’ll fade to the corner and get a wide-open 16-footer from the baseline. Nevertheless Burke wisely doesn’t force a jumper with Ridnour closing out, and proceeds to quickly get the ball inside to Favors – who is able to establish deep post-position due to the location of the screen he just set. 3. The third possession the Jazz should again have had a layup, but their timing is just a tad off. Favors doesn’t get a solid initial screen on Burke’s rub cut, but Burke sets a terrific screen for Jefferson who should have a layup springing free, but Favors is a split-second late with his pass. Instead of RJ catching the ball at the rim so he can go straight-up for a layup, the pass leads him through the lane all the way over to the left block. RJ posts up and the Jazz eventually get a Hayward three out of it, but that’s not an option you want to rely on. Even with so-so execution, you can see just a few of the multiple options this basic set provides. Not only do you get all the weakside options having the cutter run through, you can put a playmaker on the wing so after the rub cut, instead of passing to the high-post you turn it into a quick side pick&roll. 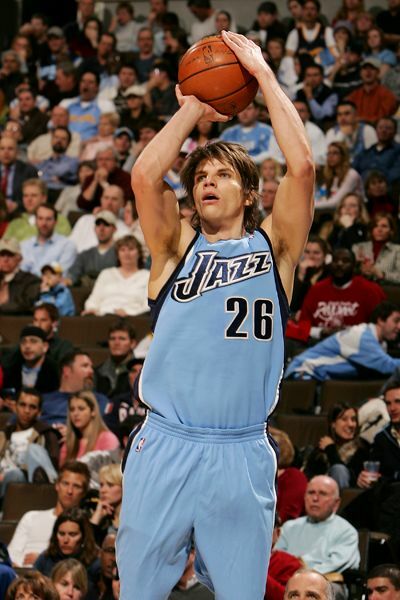 The Jazz often did this with Deron Williams on the wing and Andrei Kirilenko initiating. Similar to how the Spurs screen for their screener to setup their high screen-roll, the initial rub-cut momentarily occupies the screener’s man giving the Jazz another advantage getting into side pick&roll. Furthermore, this set can also trigger more of what Utah used to call their “auto” set and vaunted flex offense, where you pass to the wing but instead of the initiator cutting down the lane, he “bounces” back off the screen to receive the pass at the top-of-the-key for a quick ball-reversal where you have a weakside pindown (i.e. the automatic Korver/Harpring mid-range jumper). And if that doesn’t produce an open look, you have another weakside pindown with the guard screening for the bigman to come up to the elbow (often Okur) for another ball-reversal back to side of the floor the play originated on. Considering the Jazz so rarely run this set anymore, it’s certainly understandable that their timing and execution won’t be crisp and they haven’t put in all the options and variations – but last night did provide some examples of the high-percentage looks Utah can get from this oldie but goodie. The announced attendance of 16,012 represents the 4th-smallest crowd in the 23-year history of the Delta Center/Energy Solutions Arena. The Jazz have now set the 4 of the 5 lowest DC/ESA attendance marks this season. From Salt Lake Tribune beat writer Aaron Falk, the Bucks haven’t beaten the Jazz in Utah since October 30, 2001. That game was opening night and the Jazz lost in overtime on a night the overriding theme was the remembrance of 9/11 – that included this moving pregame ceremony featuring the Mormon Tabernacle Choir. The Bucks are a dreadful team with the worst-talent base in the league. As a team Utah’s level of play wasn’t great (as evidenced by a 1-possession game with 3:30 remaining) but the Jazz did take care of business at home against a team they had no excuse to lose to. While veteran starters Richard Jefferson and Marvin Williams both struggled (combining for just 6 points on 2-10 shooting), Utah’s young core provided the scoring punch with 78 of their 96 points (81%) coming from Burke, Burks, Hayward, Favors and Kanter. That talented fivesome is still yet to see the floor together at the same time (just 15-minutes in the entire season), but last night they all provided the scoring punch. Aside from the “Kanter PT = 48 – Favors’ PT” and “Favors PT = 48 – Kanter’s PT” forumlas the Jazz appear to be adhering to, I feel surprisingly good about last night’s win. Beating a team you’re supposed to beat may not be an impressive accomplishment, but it’s a scenario the Jazz have rarely found themselves in this season. Seeing the future of the team succeed while still having the opportunity to play through new experiences is what I hope the 2013-14 season is ultimately about, as opposed to resurrecting the careers of soon-to-be veteran free agents. Utah lost in Memphis as they still can’t defend. With hopes a 9th win soon would be theirs. As Memphis without Marc Gasol looked weak. The coaches settled in for another big loss. “Sit Enes! Sit Alec! Sit Derrick and Trey! In Richard! In Lucas! Teach the young guys how to play! Leave their shooters wide open! Give up the three-ball! “Miss it off-glass! Miss it off the rim! And if Alec does it I’ll go yell at him! With another road loss facing them again. Is more than 3 rebounds too much to ask? We need to play guys and develop them right. Seven years ago today, the Utah Jazz made their greatest 4th-quarter comeback in franchise history (and 5th-largest in NBA history) as they rallied from a 21-point 4th-quarter deficit with a 40-13 explosion in the game’s 12 minutes to defeat the Hawks 111-106 in Atlanta. As was often the case during Utah’s magical 2006-07 season, Jazz center Mehmet Okur provided the late-game heroics with his clutch three-point shooting. Okur scored a game-high 30 points to go along with 10 rebounds on a ridiculous 11-17 shooting from the field and 4-5 from behind the arc. Andrei Kirilenko was also exceptional – with a 12-point, 5-rebound, 5-assist, 2-steal, 1-block fill-in-the-blanks performance. They were joined in double-figures by Derek Fisherlied (18 points), Deron Williams (13 points), Carlos Boozer (13 points) and Matt Harpring (11 points). Current Hawk and former longtime Jazzman Paul Millsap – then a rookie – scored 2 points and grabbed 2 rebounds in 16 minutes of play off the bench. Joe Johnson led Atlanta with 27 points while Josh Smith added his own swiss-army knife exhibition with 23 points, 12 rebounds 4 blocks, 4 assists, and 3 steals. Atlanta’s starting lineup also included their 2005 #2-overall pick and current Jazz forward Marvin Williams. Battling a few bumps throughout the game, Marvin scored 9 points on 2-11 shooting with 4 turnovers and 3 steals. In the midst of a 5-game road trip, the Jazz saw a close high-scoring 1st-half give way to a sloppy 3rd-quarter in which Atlanta outscored them 39-19 to take a 93-72 lead into the 4th-quarter. In the final period, Utah’s monster run was sparked by rookie Ronnie Brewer who came off the bench to score 6 points in the final period and give Utah a burst of energy with his defense and hustle. Ronnie Brewer also sparked perhaps the most productive Jazz possession in team history – essentially a 7-point trip down the court for Utah. 10:34 4th-Qtr – 2 Brewer FT’s off a steal and subsequent clear-path foul that resulted in 2 FT’s in which Utah also retained possession. Hawks 95, Jazz 78. 10:23 4th-Qtr – On Utah’s ensuing possession, an extra pass by Okur resulted in a Fisherlied three that he was also fouled on for a 4-point play opportunity. Hawks 95, Jazz 81. 10:07 4th-Qtr – Fisherlied missed the free throw but Boozer corralled the offensive rebound. On the extra possession, Utah turned a UCLA set into a weakside drive and dish by Kirilenko to Boozer for a layup. Hawks 95, Jazz 83. Atlanta timeout. In 28 seconds without the Hawks even touching the basketball, the Jazz scored 7 consecutive points. Despite Mike Woodson’s (who had hair back then) timeout, Utah still outscored Atlanta 30-11 in the game’s final 10-minutes behind 12 points from Okur on 4-5 shooting. The Jazz have played a some dramatic and memorable games in Atlanta over the years – overtime losses in 1987-88 (a 130-124 overtime loss thanks to Dominique Wilkins’ 46 pts) and 1993-94 (100-96), a thrilling 101-99 victory in the 1997-98 season thanks to a Karl Malone game-winner in the closing seconds, a 90-86 win rallying from an 11-point 4th-Qtr deficit early in the 2010-11 season and of course the infamous 139-133 four-overtime debacle in 2011-12. However, Utah’s 21-point 4th-quarter comeback in 2006 is perhaps one of the more overlooked wins in franchise history, partially because it was in Atlanta but moreso due to the fact there were so many other memorable finishes both by Memo and in the entire 2006-07 season that culminated with a thrilling run to the Western Conference Finals.